In Mac OS X version 10.4 “Tiger”, the fifth major release of Mac OS X, Apple Computer’s desktop and server operating system for Macintosh computers, the OS has native built-in support for ZIP format compression and decompression, similar to Compressed Folder feature in Windows operating system (how to disable Compressed Folders). The native file achiever or compression support eliminates the need of purchasing any extra third-party software to have the ability to compress (zip) or uncompress (unzip) files or folders in Mac OS X.
Control-click or right-click the file (or multiple files selected) or folder (or multiple folders selected) that want to be compressed or zipped. 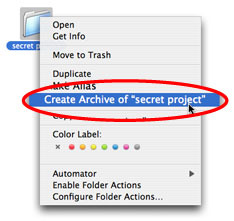 On the pop-up contextual menu, choose and click on Create Archive of “file name”. A zip format compressed archive of the selected files or folders will be created with the following icon. Original files or folders will be left intact without changes. The archive that has been created is compressed with the standard and widely used ZIP format. So the compressed files can be open by any other Mac OS X Tiger users, Windows XP or Windows Me users with Compressed Folder support, or any other Mac, Windows, Linux or Unix users that has installed application that support ZIP archival/compression format.